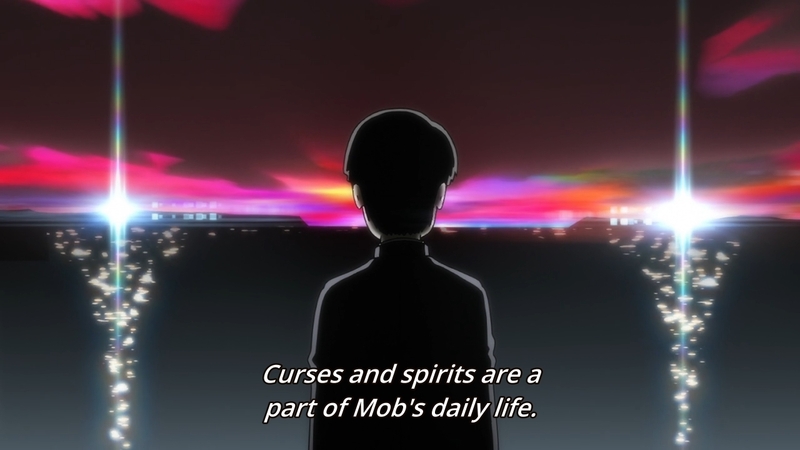 What kind of person does Mob want to become when he grows up? No one can really decide that for him. He can’t be someone’s lackey forever. He’s going to need to assert his own opinions and stand behind them. And as far as we know, no one around him can really relate. 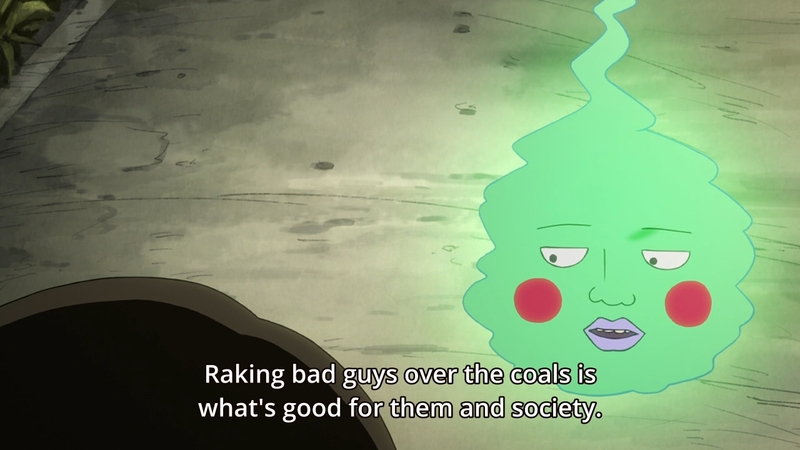 As far as we know, no one in his life can really give Mob the proper guidance and support that he needs. But that’s just the thing, isn’t it? 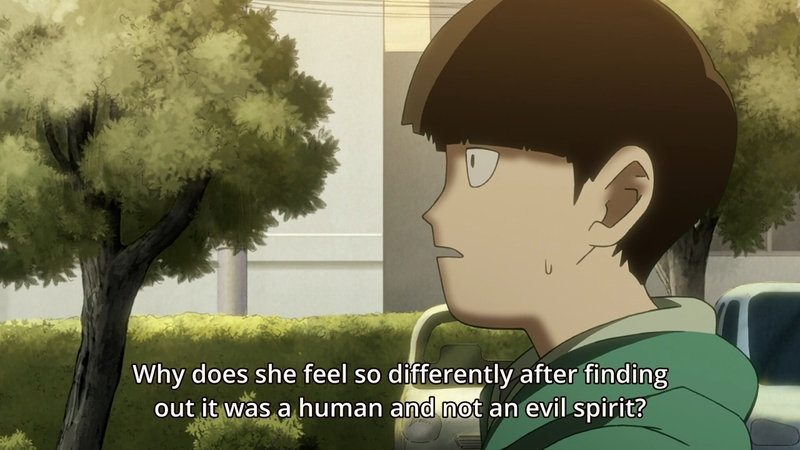 Deciding how and when to use his powers, whether to protect or eradicate spirits, whether to defend himself against bullies and jerks, Mob feels as though he can’t lean on anyone else for help. They don’t understand. They can’t understand. But the world is huge and full of people. 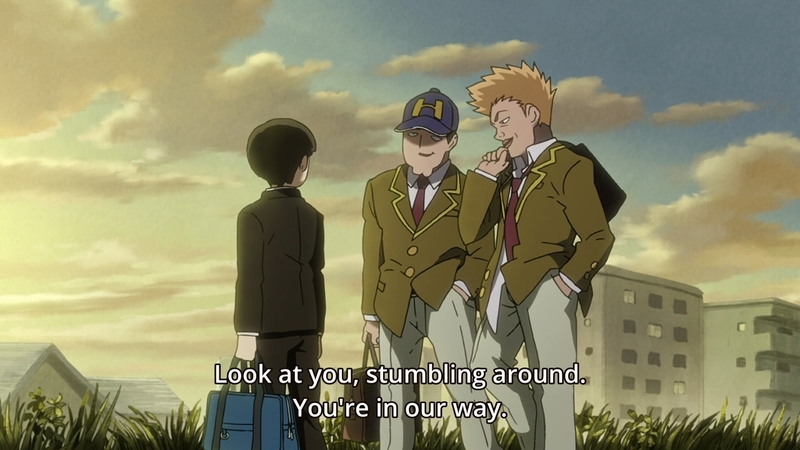 Surely, Mob hasn’t met every single person in his small town, so who knows? Maybe he’ll eventually run into a kindred spirit one day. But until then, he’s going to have to go at it largely alone. The show must go on. The first half of the episode is a non-stop rollercoaster ride as Arataka’s site rakes in customers after customers. Sadly, some are not so scrupulous, and when you have a penchant for only seeing dollar signs like Arataka, you tend to adopt the deeply-flawed “The customer is always right!” motto. The first client that we see wants Arataka to place a curse on someone. Whether the person deserves it or not is kinda irrelevant. 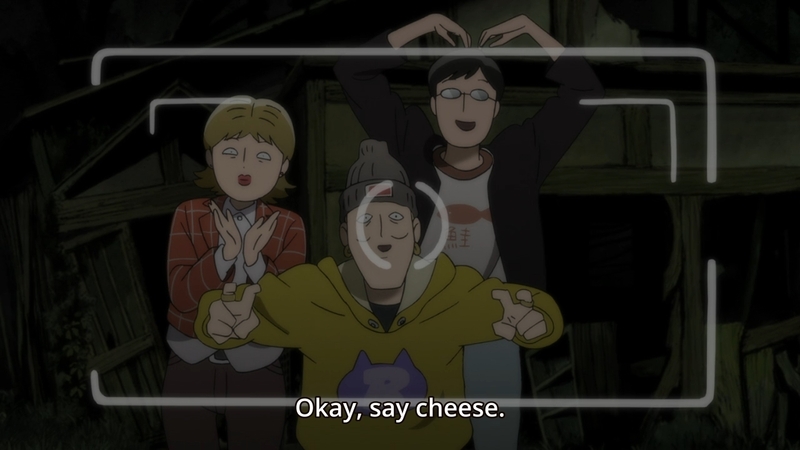 On the one hand, Arataka doesn’t take him seriously. 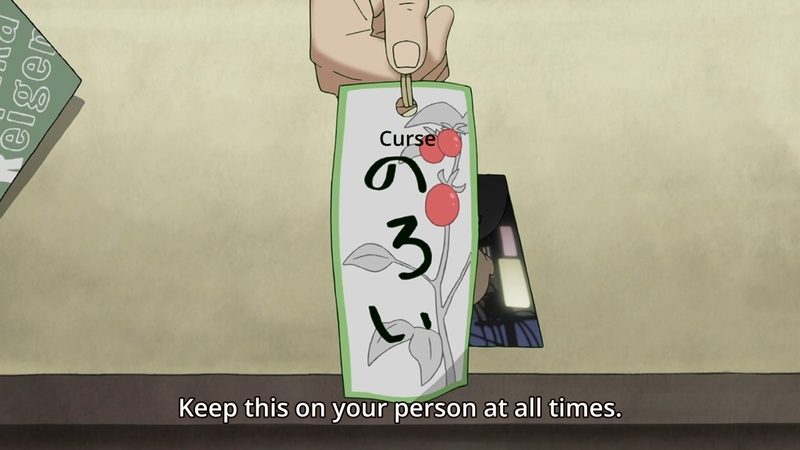 But on the other hand, he still humors the guy and creates a fake curse in the process. No harm, no foul, right? 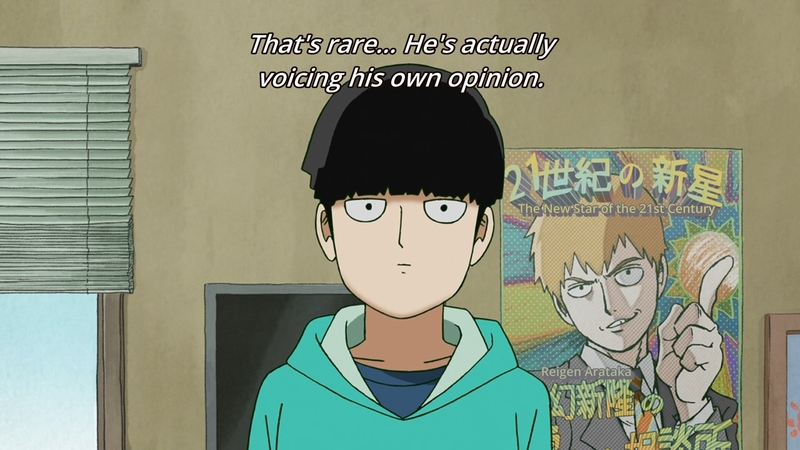 Well, Mob doesn’t really agree. 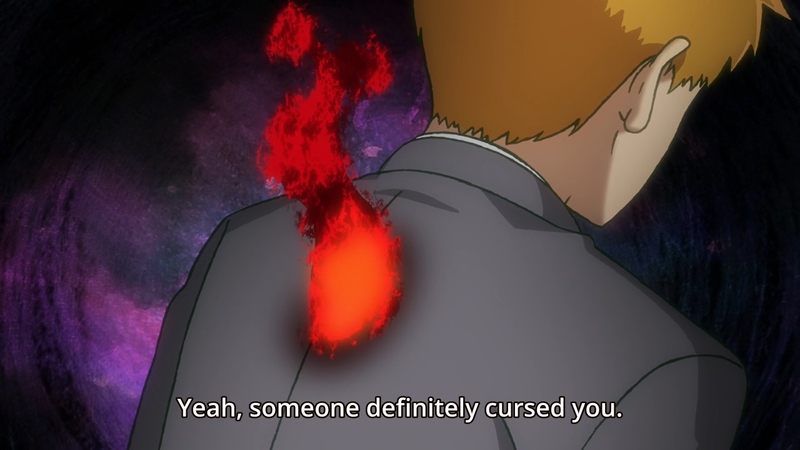 If the curse works, then he just managed to hurt someone. But if the curse doesn’t work, then he’ll go and find some other psychic to help him instead. 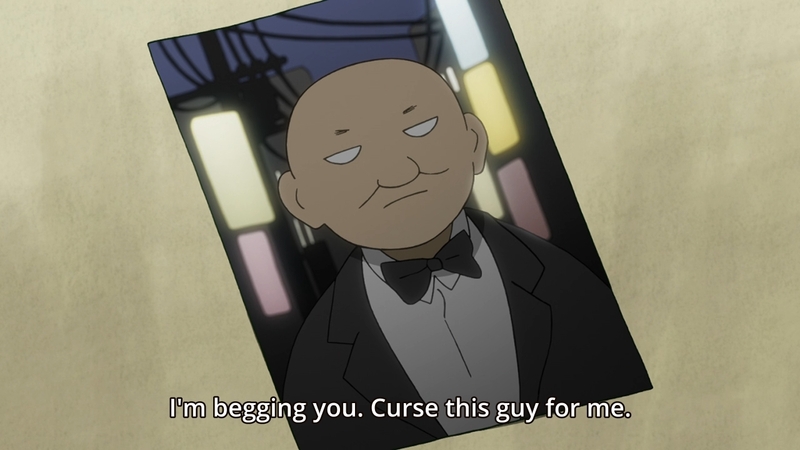 At the end of the episode, Arataka ends up being cursed, so perhaps this client had done just that. Maybe it wasn’t him. Maybe the guy has other enemies gunning for him. 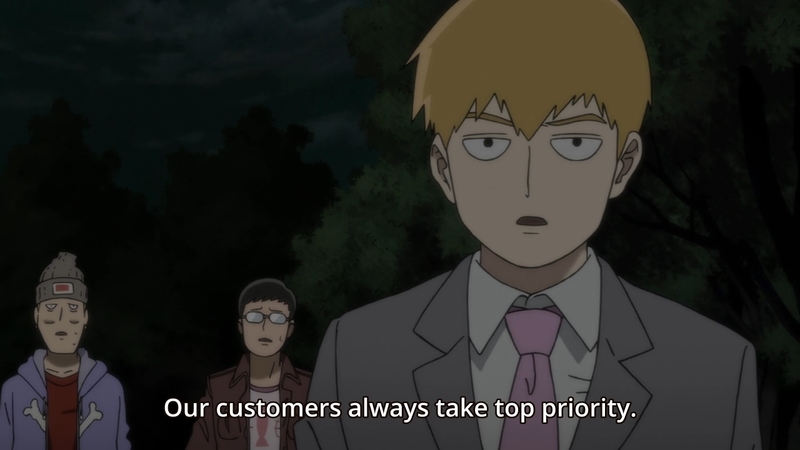 Either way, Mob probably wants to tell his master that they didn’t nip the problem in the bud, but our hero is not quite at that stage where he can openly articulate his opinions. 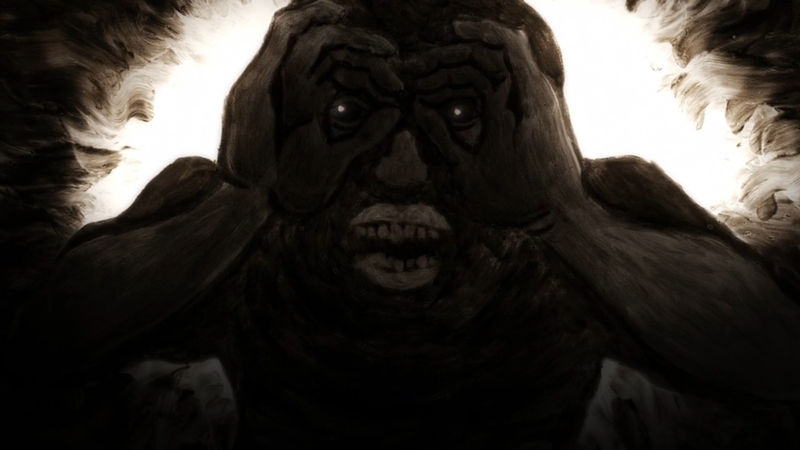 We then cut to a woman who is dealing with a peeping tom. 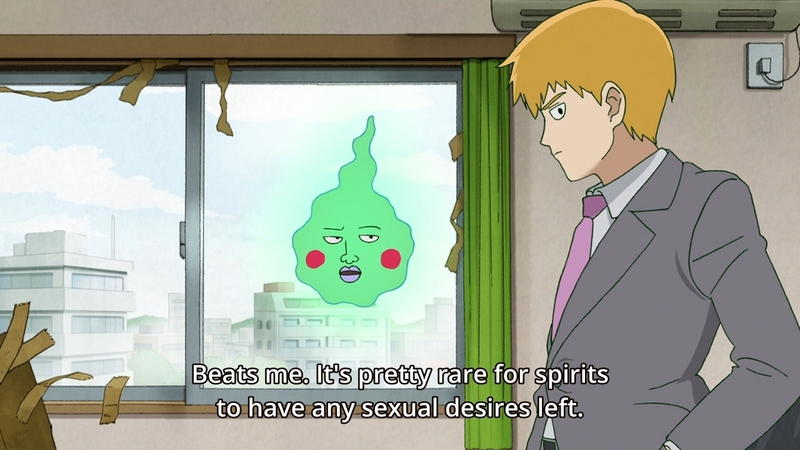 Well, she lives on the fifth floor, so it has to be a perverted spirit, right? Well, not quite. It turns out her stalker is no ghost. 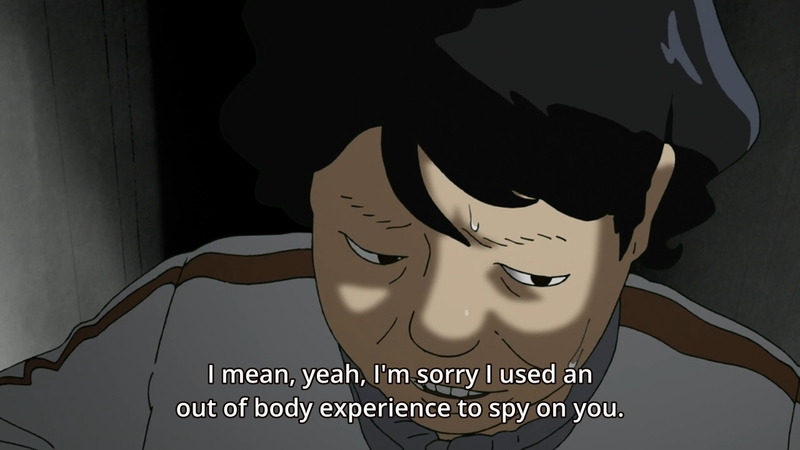 It’s just a creepy dude who can induce an out-of-body experience and use this ability to peep on his victim. Creepy. In the end, the man gets apprehended, but what’s interesting is that the woman is no longer scared. Instead, she’s just angry. She’s furious that some perv violated her privacy. Mob is, however, a bit perplexed at her change of behavior. I kinda agree, and I kinda don’t. Human stalkers can still be pretty scary. Had his obsession been allowed to continue, who knows how this situation might have escalated? In his desperation, he could have broken into her home and attacked her one day. But on the other hand, it’s as simple as fearing the unknown. We don’t know anything about spirits. We don’t know what to do about them. At best, we can only rely on dodgy so-called psychics like Arataka and hope for the best. The woman probably feels as though she has all sorts of options for dealing with a real-life stalker, but what can she do against a spirit? Our next clients are three rather braindead idiots. They want to take a spirit photo just for kicks, but in case something evil shows up, they want a psychic there as insurance. The job initially goes off without a hitch, and the braindead idiots don’t even want to pay. Great. 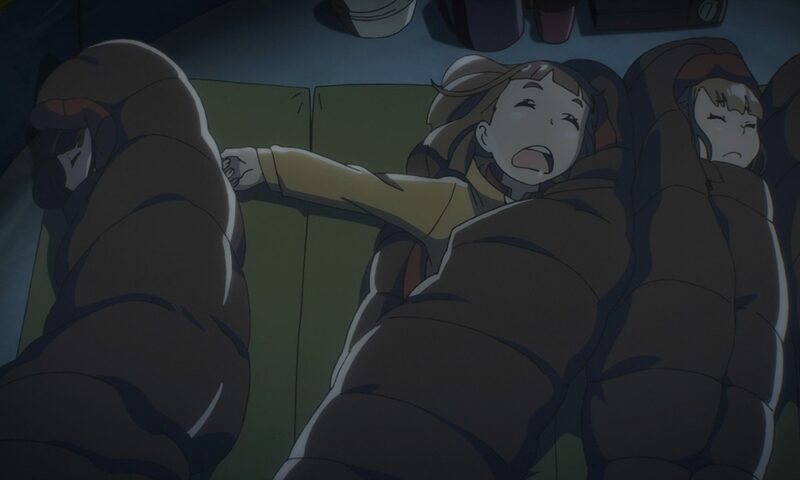 Another night ruined for Mob and Arataka. 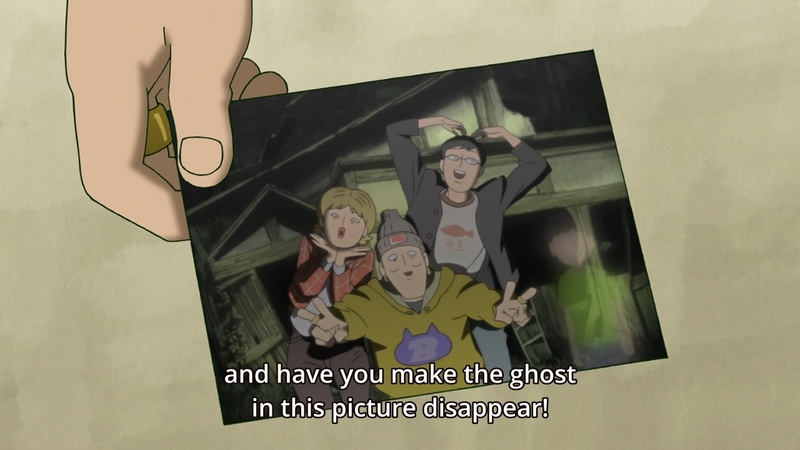 But the trio soon returns, because the spirit photo that they wanted so badly actually yielded a result. As a result, they want the scary place exorcised. Isn’t this what you guys wanted? Didn’t you guys specifically say that you wanted to create special memories? So why? Why go all the way back to the haunted place and exorcise what appears to be just a kid in the photo? Just because it’s creepy, they say. It’s kind of stupid, isn’t it? Again, it’s not like they have to go back to that scary place and thus come anywhere near the spirits. It’s not like they’re being haunted right now and at this very moment. 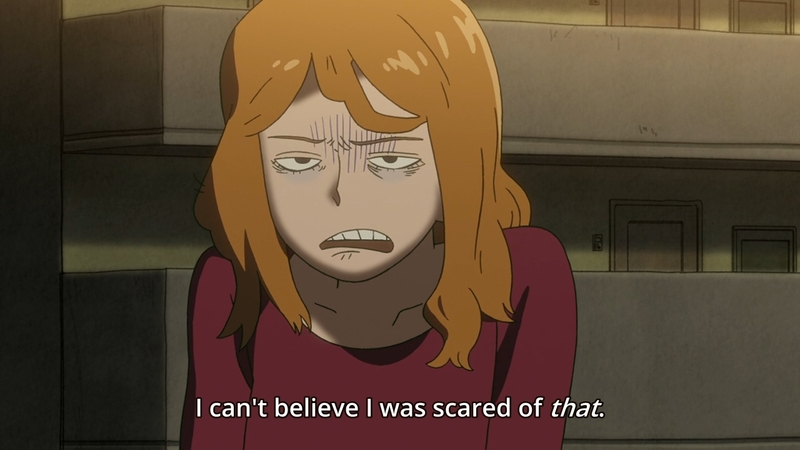 Nevertheless, they insist that Arakata take the job anyway because it’s just creepy to know that at least one spirit exists where they once stood. Again, Arataka accepts the request because a job is a job in his eyes. 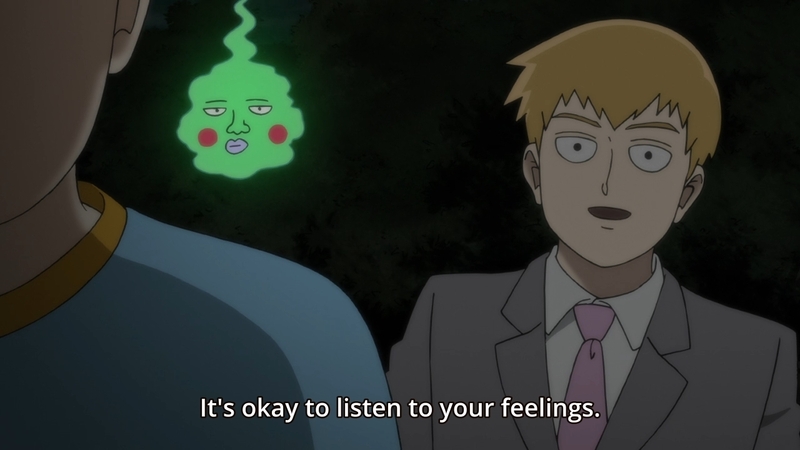 He doesn’t have the moral fiber to give Mob the proper guidance that he needs. Not right now, anyways. 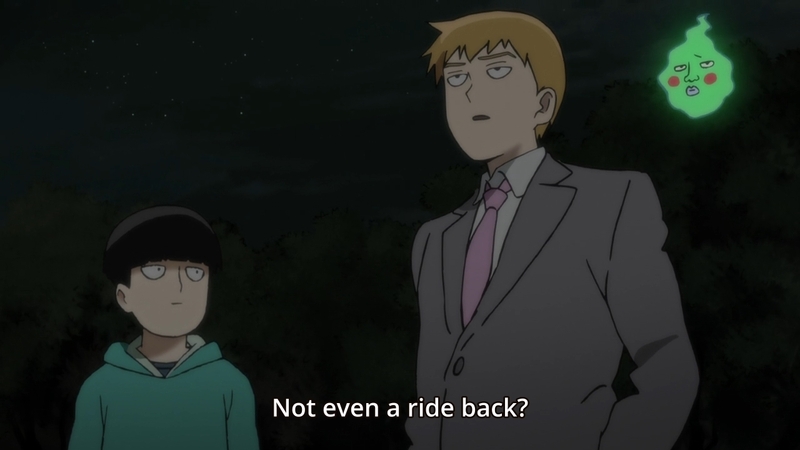 Mob gets dragged along, because of course he does. His master can’t really do anything without him. 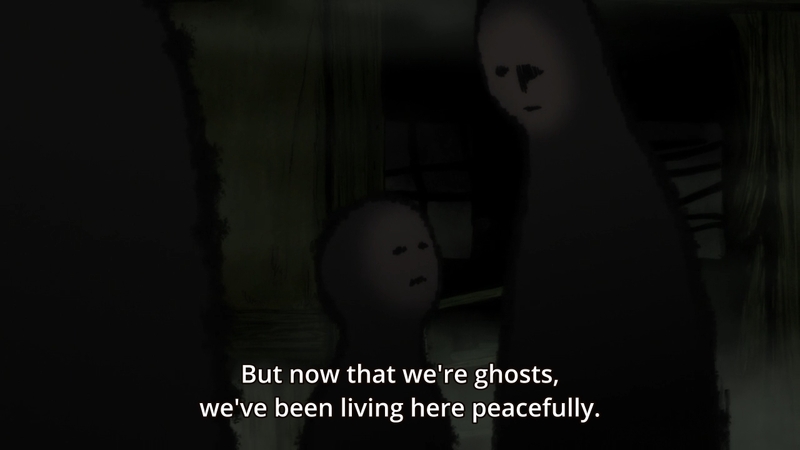 Unfortunately, our hero soon realizes that the spirits are just a family trying to exist peacefully. 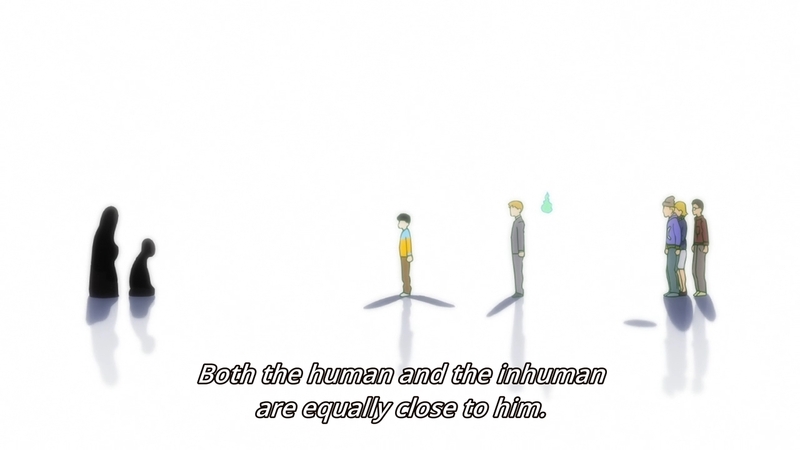 They promise to do nothing but live together until they eventually fade into nothingness. 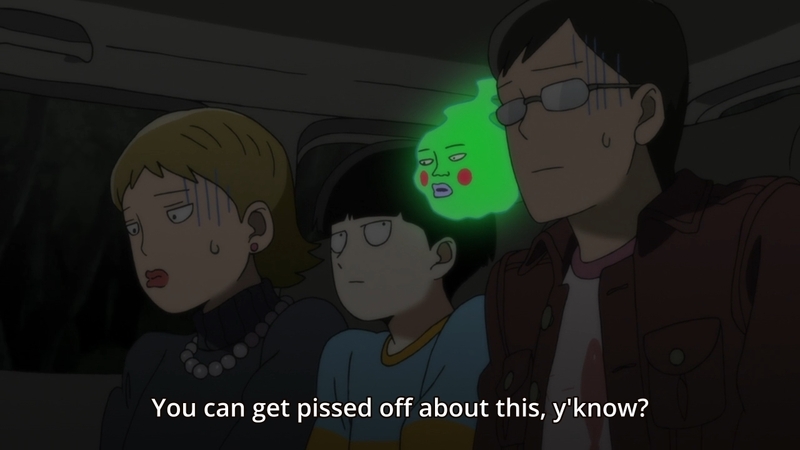 Mob thus faces a real dilemma. He doesn’t want to exorcise them. They’re not hurting anyone. But even if he manages to convince his master to let these spirits go, their clients could just find someone else to do the job. It’s like with the curse guy at the start of the episode. If Arataka can’t get the job done, someone else surely can. 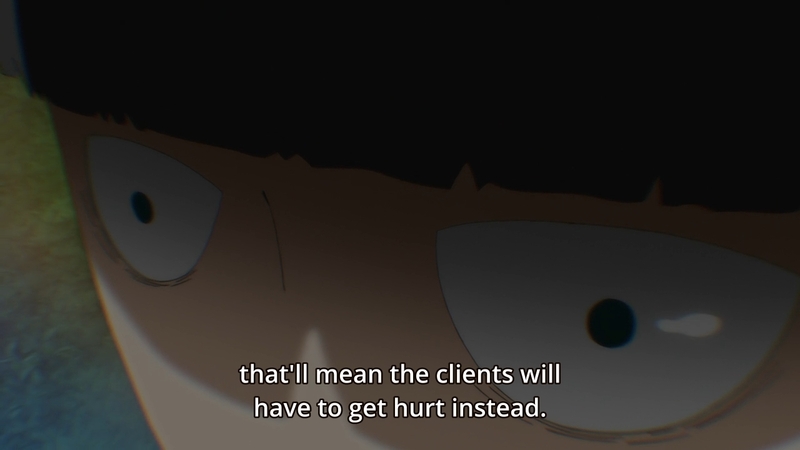 Mob then comes to the conclusion that if he actually wants to protect this family, he would have to (as they say) nip the problem in the bud: get rid of the clients. This realization causes the kid to tremble in place. This is a problem that he uniquely has, and this is a problem that no one he knows can help him with. This episode has got to be the best yet, i actually really liked it. I think part of her anger is self directed. “Why was i so scared of something so stupid?” But the whole angle of they touched there was pretty interesting. I hope he comes to view his master poorly and leaves. I just can’t get behind their relationship. 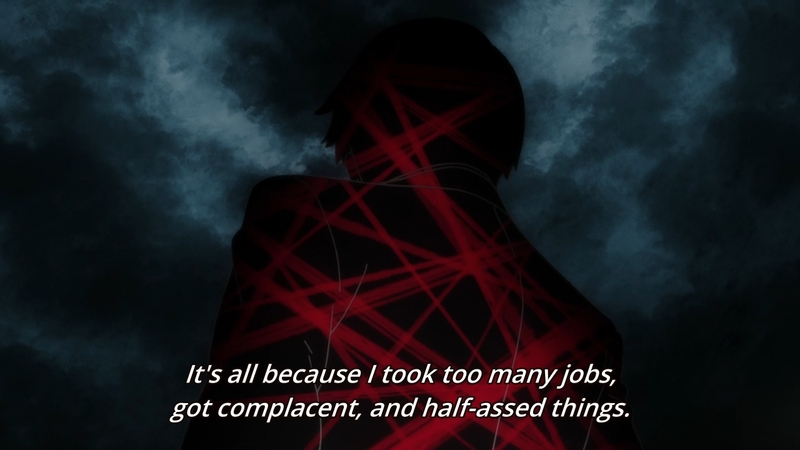 I’m skeptical of anime characters taking actions that would have real consequences.